Builders risk coverage for new home construction is a commonly issued type of course of construction insurance policy. Like most risks, that doesn’t mean it’s without distinct intricacies. How is the project value determined? What is the difference between new construction and remodeling insurance? Why would my client need soft cost coverage? What residential builders risk policies are available for new construction? 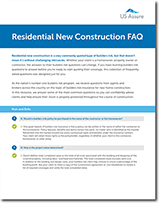 Complete the form to download our free resource and get help securing your client’s next new home construction project.